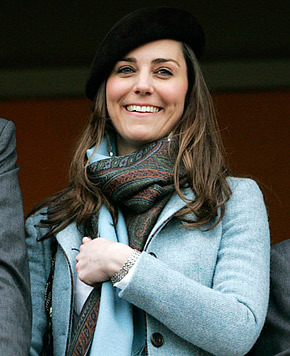 Here's Kate Middleton looking very French. Apparently she was also looking very French on a vacation at a private villa in France when some sleezy paparazzi took photos of her while she was sunbathing and thought she was enjoying private moments. Is there no honor left on this earth? I believe the royal family should take the tabloid that published the photos - and the photographers - to court for invasion of privacy. They cannot let the media (legit or not) hound Kate the way they let them hound Diana. This beautiful young woman should be free to have a life. Now, onto blog comments. Most of the comments I get are on-topic and constructive. My regular readers - and the vast majority of newcomers - are fabulous, knowledgeable people, and I love you all. I don't want to moderate my comments. I think the conversations in the comments are fascinating, and I love them. So, I moderate only comments on features that are more than two weeks old. That usually keeps the spammers at bay. Unfortunately, there is an occasional visitor who leaves an ugly comment. I deleted one recent one quickly - as soon as I saw it. The anonymous writer accused me of having no integrity. You will recall that I criticized the fall Tom Ford collection. That's my right. It's my blog. I even wondered if the cowardly comment came from a Tom Ford representative, but the ones I know have too much integrity to write a comment as ugly as that one. She/he was sure I hadn't seen the collection and was snarky - both about me and my readers. Yesterday (and I left up her comment yesterday, but responded strongly and then closed comments), a nitwit apparently took offense at our criticism of Kristen Stewart. Stewart is not exactly a role model of proper behavior, and apparently her fans aren't either. The commenter writes a silly blog, basically a family journal, believing that the world might be interested in her love letters to her perfect children. It was a nasty comment about my blog. I cannot even imagine leaving a comment like she did - on anyone's blog. The anonymity of the Internet apparently brings out the nasty people everywhere. I have just deleted her comment and my response, "Well then, dear, you don't need to come back. Don't let the door hit you on the way out. People who emulate Stewart's rude and thoughtless behavior are not welcome at BTiB." I don't usually react so sharply, but I was really annoyed by the rude comment after a long day at work. If she does come back, her comments will be deleted. There's no room for that kind of negativity here. Negative comments about products? Fine! We want to know what kind of experiences you've had. Negative comments about the blog, or my integrity, or the integrity of my readers? Nope! We are not going there. I hope you feel the same way. As for the perfect mother and her perfect family? I fear her perfect children will grow up to be like her. Now, onto beauty! Let's talk about your week of beauty. It's time for the Friday Forum, our open chat. What new products did you discover this week? Did you find any deals you couldn't resist? Are you using a fabulous product and want to sing its praises? Did you find a beauty product disappointing? Do you have a question others might be able to answer? Want to talk about skin care? What's new in your life? Just use the comments. Don't be shy. Just make sure to ask any question you might have over the weekend. By early the next week, most (not all) readers will have moved on. I purchased way too much during beauty week. My friends at work are enjoying their new totes, and I'll have little goodies to put in contest winner's boxes for awhile. Many thanks to all my sweet friends at Neiman Marcus. There are two more promotional events coming up, but I am having trouble getting photos: Bergdorf Goodman and Barneys New York. I placed my fragrance pre-order at Bergdorf Goodman with Maddi. You can reach her at (212) 872-2733. Don't forget to enter the giveaway contest for LORAC's PRO Palette. The deadline is tomorrow, Saturday, September 15. I think the winner will love it. Thanks so much, Katheryn! It's beautiful out, and I get to work from home. All is well. Mom had been doing pretty well, except for falling and needing stitches in her arm. Thanks! Your blog is deadly to my wallet! I read about products and add more to my want list. I also lament about the fact that some brands are unavailable in Canada (cannot be shipped here, either). I appreciate your honesty. This not a forum for rudeness. What did I buy this week? Way too much. Two items are the Arden single eyeshadows in Seashell and Smolder. So far, I like the colors and texture. Charlestongirl, as my kids would say(they are 24 and 27) "Don't let the haters get you down!" Love your blog and hope you have a wonderful weekend! Umm...the "Nina" poster here isn't me - just so you know! I have no criticism of your fabulous blog! And I concur with grinxdor - don't pay any attention to the haters! Where do you get your EA? Macy's is the only store here that carries it anymore, I think. Thanks, Grlnxdor! No worries. The haters bother me for a few hours, then I remind myself how many crazies there are out there. The Tom Ford comment was VERY similar. Wow! The only thing added here was a discussion of his sexual preference. I wonder if it was the same commenter. Double wow! My newest Chantecaille arrived yesterday, and I'm headed out to take photos. It's gorgeous. I already dropped a bundle at BG. May be too broke to spend at Barneys. Debt? Hey Nina! We have two Ninas? Cool! Thanks much. This week I got lucky: I might have mentioned how disappointed I was in the Caudalie cleanser I used last week. It was effective, but I needed so much of it, and needed so many cotton pads, it made no sense. So this week, when the shops had Nuxe Eau Micellaire on super-special, I couldn't resist. I haven't tried it yet, but can't wait to! Cg, your blog is THE BEST ONE OUT THERE! No comparison! Gotta say something about the Tom Ford comments you talked about: I bought some of the TF Fall stuff. The Plum Absolute creme shadow, the lip/cheek stain, and the Narcissist blush. The blush is OK, nothing special, and I am keeping it, but it is not worth $55. The creme shadow was so awful I am at a loss as to how to describe it. Rock hard! Not creamy at all. Had to dig it out/off with a creme shadow brush, and then it left tiny chunks of color on the lid. I went back to one of Sabrina's reviews about TF creme shadows, thinking that would enlighten me, but all she said was that they were creamy. Not so with mine. The tiny bullet of color for the lip/cheek stain was so wobbly that I feared for it the first time I used it. And it did in fact tilt, like a 10 degree list. Both went back. I love the Guerlain Les Fauves you blogged about recently; without your blog and the hard work you put into it, my lousy life would be a total disaster! Never leave us! I also enjoy reading comments here. You've attracted very nice people, so don't let a bad apple spoil it. As for my week, would you believe that in order to try Chanel's Coco Noir (I know the general opinion is unfavorable, but I still want to smell it!) I had to buy a sample off ebay. A sample! You know I live out here in the boonies, but I had to be out of town this week, and I ran to a Belk. No luck. They didn't carry Coco Noir! Will hope the sample arrives next week and will report next Friday. How about these slightly cooler temps? Feels fabulous to me! Have a great weekend. I trust your opinions about beauty products because they are based on multiple uses of the product. I am sure if the bottles, jars and compacts were in a non- discript container, your comments would be the same. About 23 years ago, I was tired of a co-worker's viscious comments. I said to her, without any forethought, " I wish I had a mirror to hold up so you could see how ugly you are when you say that." She didn't speak to me for days and then she actually nice. Now, I think of a mirror when I start to have mean thoughts because I believe that ugliness on the inside makes an ugly outside. Perhaps there should be a mirror with the preview tab! Thank you for your writing. I have bookmarked your blog and I enjoy shopping with you. Actually, I'd love to visit for a tutorial make over! Good morning everyone. On the beauty front, I bought the Armani Fusion foundation this week and really like it. Just lately our weather has ranged from hot to hotter and the humidity level has ranged from bone dry to tropical and yet the Armani Fusion has held up well throughout. It feels soft and like nothing on the skin and I haven't had any makeup meltdowns. So far, so good. Other than the new Armani and my Chantecaille (Elephant palette, Amour Lip Chic, and the darling elephant blush--I gave the gloss a miss because I'm still too enamored with Troublant), I'm being very good about waiting for the Holiday releases that begin mid-October. Oh, and I did order a bottle of Oranges en Fleur. I went through my sample in record time and couldn't stand the thought of being without this soft and sultry scent. I just wish I had had it back in May as I think of it as a warm weather scent. I saw the churlish comments in question and applaud your decision to take them down. You do not have to leave any offensive, rude, or abusive comments up for all to see. Spreading such ugliness is not what BTiB is about. It's bad enough that you have to read such vituperative remarks. There's no need to spread the vitriol by leaving such comments up for the rest of your readers to see. We all know that there are bullies and haters out there who are emboldened by what they erroneously assume is anonymity. Putting other people down is how they compensate for their own feelings of inferiority. As Keyvn Aucoin famously said, "No amount of makeup can mask an ugly heart." And, even though these haters are lurking on beauty blogs, they ultimately reveal their ugliness through their words. Sorry for the rant, but I hate to see a source of beauty, joy, and comraderie come needlessly under attack. In your blog, you've created a delightful and companionable place to visit. Since I seem to be channeling ;-) Kevyn Aucoin this morning, let me end on another one of his quotes: "Today I see beauty everywhere I go, in every face I see, in every single soul.". And you, dear Charlestongirl, and your lovely readers are examples of the beauty that is all around us. Eileen, beautiful Aucoin comment. Thank you. Hi CG, the internet does seem to bring out the worst in some people. It's OK for people to disagree with you but not in a nasty way. I love your blog and really appreciate your swatches. I hear about things I wouldn't otherwise hear about. It is certainly your perogative to edit out the nastiness. I'm hoping to be able to pick up all my Chantecaille this weekend. I'm going to try to get a sample of Oranges en Fleur when I go into NM. I'm not big on fragrance but you have me so curious about that one. My only other beauty purchase this week was Chanel's Skyline nail polish. I'm going for a manicure after work today. Nemo - I have one of the TF creme shadows and it is very creamy. Either they changed the formula (but we would have heard of that) or you got a dud. I think quality control definitely missed it. No new makeup purchases this week, just ordered some hair care by Alterna which I really like. I've been in a holding pattern since I saw the PR for Guerlain's holiday collection which looks gorgeous and expensive but still needs to come home with me. :) I will have to choose carefully. I need to explore Hourglass more. Much more! BTW, isn't that GWP at Liberty fabulous? I haven't looked at their shipping fees to the U.S. Fear I'll go wild. Fortunately, comments like that are rare. I have such nice readers. I'm sorry the TF didn't work well for you. I remember you were really looking forward to receiving it. Darn! It sounds like there may have been a serious quality control issue (or overheating on shipment) with the products you received. We have a great group of regulars! I think that woman was drawn by my Twitter post. Some people search on celebrities, and that's probably how she arrived. Hopefully, she will be out trolling celebrity sites, not beauty blogs. If you like Coco Noir, let me know, and I will try to collect samples here for you. I loved the top and heart notes, but the dry-down was skanky on me. That is a total riot - and a great idea! Love it. BTW, you were really brave to take on that woman. I would probably have suffered in silence. Kudos! I knew some readers have to have seen her comment. I had the night to think about it before I whacked it. Isn't that Armani "foundation" the most amazing product? It's getting rave reviews. One makeup artist I know called it a primer. Interesting concept, but if it's a primer, I won't need foundation on top! So glad you got the Houbigant. I adore it! Hope you like Sky Line! Did you order it online? I think you will love that fragrance. Besides the beautiful scent, the packaging is stunning. Very classy. As for the Chantecaille? Swoon! I don't know why some people feel that because you have a blog, you are fair game for their rudeness. Baffles me. Anyhow, we are ALL saving our pennies for the Guerlain Holiday! What a stunning collection! I will be in debtor's prison soon. Thanks so much for commenting, Sam! Very sweet. I try. You REALLY need to go look at the Chantecaille collection. I'll be featuring the other lip color and the HD powder over the weekend. They are amazing too. What extraordinary makeup! I'm so sad to hear about the rudeness on the blog. I agree with the previous commenters-I love coming here. This is the first blog I visit every day. You are passionate, intelligent, and fair in all of your reviews. You have also introduced to some great brands that I never knew existed (Chantecaille-which I am now obsessed with). People can disagree without being rude, though I find that is rare on the Internet (and in politics). I had jury duty yesterday and found much rudeness there as well. People will do and say anything to get out of serving. Thankfully, many of these people were excused. It looks to be a very ugly trial and I would not want to have to deliberate with any of those people (should I end up on the jury). In happier news, I received my Armani gloss this week and I have a new favorite gloss formula! Plus, the color is perfect-a true MLBB color. Love, love, love it. I hope everyone has a joyful weekend! Hi I love your site its so fun to read. Love cosmetics and dont know why people would get upset about a negative comment about a product its your opinion and for goodness sakes its about makeup!Its not earth alterating info. I have tried a few brands that I would disagree with you on that I think are not worth the money that you havent given good rating to. I still read what you have to say different things work on different people. You rating a product is no different than the option you have at neimans or saks site and those people are not as kind as you when they dont like something. As for Tom Ford I agree with you its ok but not exceptional I think the blush looks nice the lipstick is to dry as well as I have never been as disappointed in a foundation as I was in this line it was so dry not for the dry skin girls and the shadow is so gittery I feel like I am in the 80s again but hey not my first makeup blunder. If anyone wonders if I have tried others to compare to I have used it all from Cle de Peau to chantecaille, la prairie you name its in my cabinet. So dont hold back tell it like you think. Keep up the good work. Yes, I bought Skyline at Chanel.com. It's a pretty blue. I hope it looks as pretty on my fingers. I just got the phone call I've been waiting for! My NM Chantecaille SA called and said "All the babies are here!" So I get to pick up all my Chantecaille goodies tomorrow. I got one of everything! She's also going to get me that Houbigant sample so I'm eagerly awaiting tomorrow. Have a great weekend! Oh, dear. I fear the internet can be, at the worst of times, a forum for fodder. I must say, though, that a blog should always remain a place for freedom of speech. Yes, it's true that people don't often agree with the views of others, but that by no means justifies treatment that is tantamount to slander or abuse. You have my heartfelt empathy. I am pleased to say I am now (finally) the owner of Chantecaille's Lip Chic in Amour. It's everything that I wanted. It gives me a 'my lips but better' look. I love the formula, and I was introduced to it thanks to you. All the best to you this weekend. I do not tend to leave comments on the beauty blogs I regularly read, but I wanted to let you know that I appreciate what you do---I love reading your reviews and seeing your gorgeous swatches, and simply cannot understand why people would leave nasty and inappropriate comments when they could simply leave the site. I firmly agree with the old adage, "If you don't have anything nice to say, do not say anything at all." Have a wonderful weekend, and thank you again. LOVE your thoughts and swatches on products! I found a couple jars of Chanel Illusion d'Ombre Apparition and they should be here soon, yippee! I did not see the rude comments that were left. However, it baffles me that people seem to think that 'hiding' behind their computer screen grants them license to say whatever to whomever they wish. If you wouldn't say it to someone face-to-face, it definitely doesn't need to be left on a blog, twitter or Facebook post. Your blog is a lovely respite from the every day grind. You review products that I don't have easy access to - which can be hazardous to my wallet! I appreciate your thoughtful comments. If a blogger only lists the company website write up & no personal insight, more than likely I won't be back. The passion you have for writing your blog comes through in each post. I look forward to continuing to read your blog for years to come. Makeup related - purchased Laura Mercier's Bleu Marine cake liner. I wore it years ago - don't remember why I stopped wearing it. With my hooded eyes - tightlining really is the best liner style for me! A primer? Really? Well, that's an odd notion. I wonder if that MA has actually used it or if he/she has only read about it. I can't imagine putting anything over Fusion other than the usual blushers, highlighters, and finishing powders and I love the level of coverage I get. True, the coverage is due more to the light diffusing nature of the pigments than actually covering up the skin with an opaque layer, but a primer? Hmmm . . . I'm sorry you had to deal with nasty commenters. You don't deserve that. Try not to let them eat up any more of your time and energy. You'd think with age comes sympathy, acceptance and kindness. Mean girls can unfortunately grow up to be mean women. Haters are gonna hate. I also apologize for avoiding your blog and other makeup related blogs. I've been trying to not tempt myself into purchasing any beauty related products while saving money for a new bike. I went a little overboard with neglecting my hair, skin and nails. I chose to spend my extra time riding instead of sitting at the salon. Slowly realizing that I need balance to feel beautiful inside and out. Oh, I am so saddened to read that your mother feel and needed stitches. Even though I don't visit to find out, I have been thinking and praying for you both. You are all so sweet, I don't even know where to start. Thank you. Your comment reminds me of a plan I had hatched once. You probably won't like it. I didn't ever want to serve on a long trial because I'm self-employed. No work = no money. So I figured I'd tell the truth: I am a psychologist, but I believe that all murderers, animal abusers, and child abusers should be tortured. Think that would work? Tee hee. Enjoy that wonderful Armani gloss! We do have Hourglass. I was supposed to set up a master class at SPACE.NK, but Mom got sick and I had to bow out a few weeks in advance, knowing I'd be out of the loop for awhile. I want to re-up that fun offer soon. I am beginning to think that Tom Ford aims for the fashion-forward set. I love fashion, but can't claim to belong. I'll reserve judgement until our counter opens - soon. You've got some great stuff in your cabinet! Hi Jo! Yea! You are going to love your new Chantecaille. I used my Sky Line for a giveaway, so I wasn't able to test it. I read somewhere it was bubbly. Did you notice or experience that? Yea, Walls! Isn't Amour fabulous? I now have two, and I may get a third and hoard it. Yeah, Eileen, can you believe it? He has tried it because his counter is diagonal to Armani's, and he also got trained. Judith, you lucky gal! You bought more than one? Thanks so much, Wendy. She is doing well. The doc thought it looked good when she checked in this week. I was fit to be tied because she got up without help. What do we pay those 24/7 caregivers for? Have fun riding! What a wonderful hobby. Horse, nature, and fresh air. Be safe! I adore your blog!! Unfortunately, at times the internet is a mixed blessing. For fun news...I got two new handbags this week at the Macy's sale - a Coach hobo and purple Michael Kors tote (sooo gorgeous). My Armani Maestro Fusion foundations arrived yesterday (I got 4.5 and 5 as I wasn't sure which color would work) but havn't had a chance to try them. I ordered the Chantecaille Amour Lip Chic from Nordies. I'm debating on getting some items from the Bobbi Brown Uber Basics collection but really don't need anything - but then again, when do I? I'm sorry. I've really hated watching bloggers I enjoy suddenly change the tone of their blog (usually fewer personal opinions); sometimes it's because their real life got too big but sometimes it's because someone got personal or nasty. It's fine when it's their life; I can barely update my blog monthly. But it's depressing when it's because someone's been nasty and ignorant. I got Skyline! It's so pretty! I also got YSL nail lacquer in Rouge Expressioniste, perhaps my most perfect red ever. Where are we (NOVA) getting a Tom Ford counter? Mazza? I hope we get an Edward Bess counter soon, too. Hi C-g! I just wanted to say that it kills me to see you hurt in any way and it is a darn shame that you have to close down comments because of so many shameless, ignorant people. You must have realized that more nasty comments were to come, and you did make the right decision. I love your blog and certainly will keep on reading it. I love how you inspire me to try beautiful new things that I never would have known about if it weren't for you. I agree with most of your commenters here. It seems that you have many readers who are very fond of you. As for what I bought this week--here goes: Maybelline Define-a-Lash (and I love it! ); Maestro Fusion Makeup by Armani (thanks for the great, thorough review and I love it); two makeup brushes from MAC: #217 & #239; 3 MAC eyeshadows including Satin Taupe which I have been reading about; a NARs lip pencil in Tonga and a NARs lippie in Bilbao; a Smashbox lippie in Electric Pink matte (a free lip tech in Peony was a GWP); and last but not least a Chanel Le Crayon Vernis in Natural. Whew that's all. I don't usually buy so much in one week and I am done buying for awhile! Hang in there CG, and know that you have many many readers who are really fond of you. I would love to know how to get a job where you work, so I too could be a "friend at work" and benefit from your generosity! Do they do any publishing there?? : ) Kidding but not really . . . I love Sky Line! It's a pretty pop of color on my fair skin. CG, I got a professional manicure and the manicurist did not have any trouble applying it, no bubbles! I'm off to go downtown to pick up my Chantecaille. I just read your review about Isis and I can't wait to try it on! "Maybelline Define-a-Lash (and I love it! ); Maestro Fusion Makeup by Armani" - you would have done well with just those two things, but the rest? Sounds like you had a fab week! Those gals do make out OK. They get products to test, fragrances samples, always a NM tote. Jo, I am so glad to hear it's not bubbly. Ellen won one here, and I'd hate to think it's a dud. I was wondering if you tried any of the Japanese brands that seem to be amazing- namely Suqqu, Addiction by Ayako and RMK- I would love to here your thoughts on them. Kate is so beautiful. I do not care about K. Stewart, I have never seen her movie because I do not like that kind of movies. I did not even know that she is a new Balenciaga face. I like Charlotte Gainsbourg, and love Balenciaga perfumes. So I am very excited about this new fragrance. Thanks for the review!